A household name strain with a Jetty Extracts twist. Northern Lights #5 is made from the best plant material in California. Single-sourced, ultra refined, terpene infused, and then packed in a pod for convenient medicating whenever, and wherever, you go. An indica dominant strain sourced in small batches containing 85% total cannabinoids. Generous, herbaceous flavor with rich effects. This heavy-hitter is favored for nighttime use. 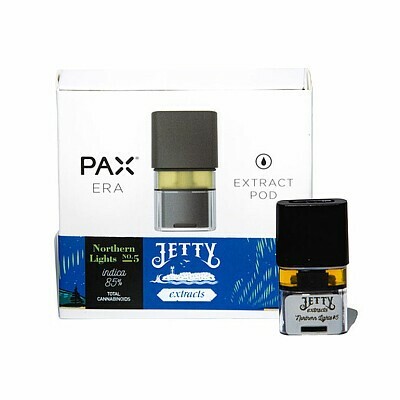 Era Pod is compatible ONLY with PAX Era devices, available separately.